Keep your feet in top condition with the support and good looks Justin® has become famous for. Featuring the innovative J-Flex Comfort System, a combination of a cushioned insole and triple-density insole board, so they'll feel like your trusty ol' favorites the first time you pull 'em on! Plus, the StampedeTM rubber and EVA outsole provides top traction on any surface. Justin Mens Stampede Western Boots is rated 4.9 out of 5 by 8. Rated 5 out of 5 by BenS from Great boot! Be aware they seem to run a little small and may take a few days to loosen up. Rated 5 out of 5 by Teddy from Love them! Rated 5 out of 5 by RAF1 from Great Price The boots are nicely made. I like them so much I order a second pair for my son. Rated 5 out of 5 by Mikeles from Well Priced Quality Boots These boots are described as "work boots". That description doesn't do them justice. They have the qualities desired in a work boot with the looks of a much more expensive dress boot. They're sized accurately, are very comfortable, nice looking and priced right. 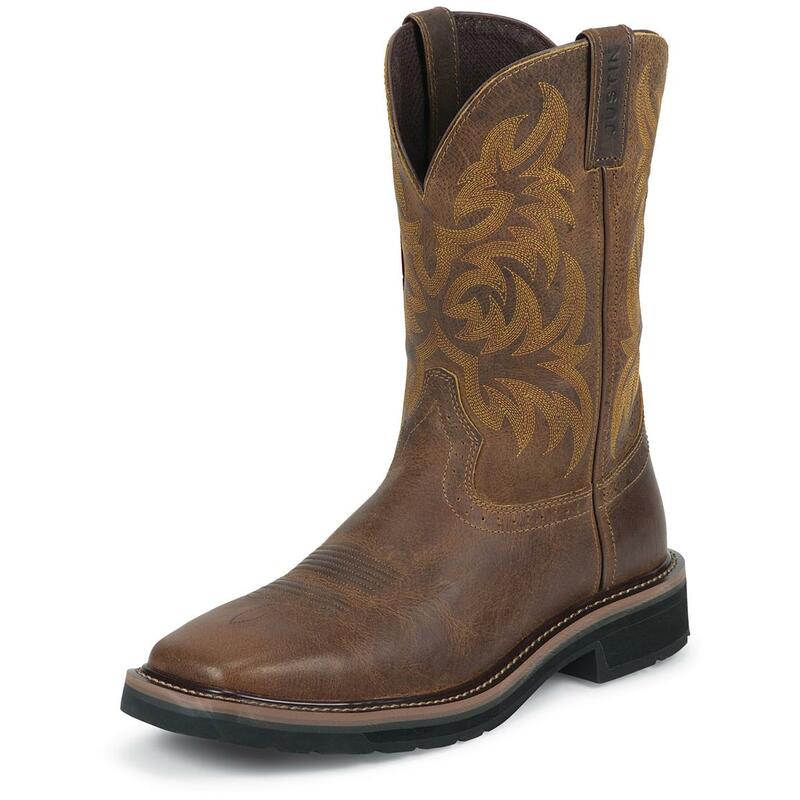 Rated 5 out of 5 by Bojack from Justin Boots great value... great for the money... For work on farm and show. Will buy again. Rated 5 out of 5 by Michael from They are very comfortable for all day use. Rated 5 out of 5 by KennyB from Really good deal on these boots! Another pair of great quality boots by Justin!